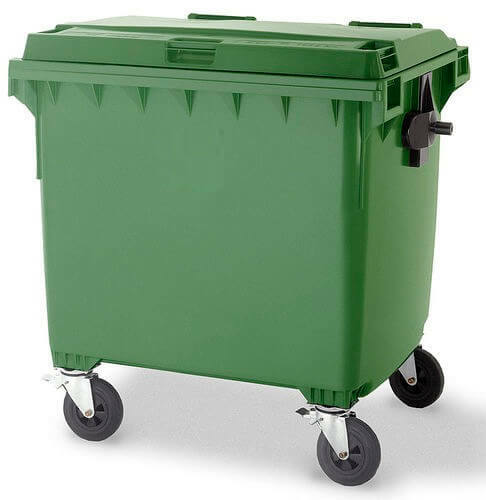 Carbery was among the first suppliers of wheeled bin solutions in Ireland. Today, Carbery continues to supply waste management solutions to local authorities and waste management companies nationwide. For ultimate product durability and longevity, Carbery’s 1100 litres 4 wheel wheeled bin is manufactured from premium quality High Density Polyethylene (HDPE) and all metal parts are galvanised for protection against corrosion. This result is a wheelie bin which possesses excellent frost, heat, impact and chemical resistance properties, whilst a smooth interior helps prevent waste and rubbish from sticking during emptying. Every wheelie bin supplied by Carbery is manufactured in accordance with EN840 and is fully compliant with noise reduction requirements. Cadmium free, all Carbery wheelie bins can also be recycled at the end of their operational lives. For corporate customers and local authorities, a wide range of options is available – including customer specific colourways, tagging and corporate branding. 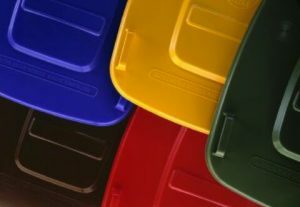 Carbery wheeled bins are available in a choice of standard colours – grey, green, brown, blue, yellow and red. Additionally, a wide range of product options is available for Carbery wheelie bins – subject to minimum order quantities and at additional cost. To discuss product options and availability, call us on 00353(0)23 883 3531 or contact us online.